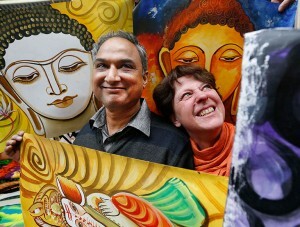 Over 150 exhibitors will take part in Mind Body Spirit in the RDS later this month. A Kildare man who began studying the art of Accunect after noticing an imbalance in how people view themselves, is set to take part in the Mind, Body, Spirit and Wellness Festival and Dublin’s RDS from October 29-31. Ireland’s longest established wellness festival celebrates its 21st birthday this year with 75 life-enhancing talks from top Irish and international experts in the fields of positive psychology and self-help, plus exhibits by over 150 complementary and healing practitioners. David Doran, from Inchaquire, Cookstown practises the relatively new therapy which, he believes, allows inner healing. Leading US Feng Shui expert Amanda Collins, whose clients include Bloomingdales and Dreamworks filmstudios, will reveal how you can set up your home to find financial freedom. Psychologist Michaela Avlund, author of Happiness Skills, will be explaining how increased joy and well-being is within everyone’s reach, while nutritional therapist Ola Mazurkiewicz will be giving diet tips to tackle your personal energy. The live stage will be buzzing with free entertainment as a lively mix of 45 performances including music, dance, drumming and yoga demonstrations take place over the three-day event. The Mind, Body, Spirit and Wellbeing Festival, October 29-31 at the RDS, Dublin.